Here are all the caravans we have located in Somerset. Either click on a photo or follow the "View This Private Caravan Rental" link to view a full page listing of the caravan rental. Details in the full listing include photographs of the holiday caravan, a full more detailed description of the static holiday caravan, the rental rates, availability, any special offers or last minute discounts and of course the contact details for the holiday rental caravan owner. 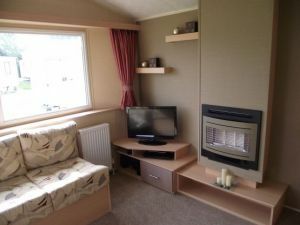 Brand new Sept 2011 8 berth 3 bedroom caravan, rated Gold plus by Butlins. Fully double glazed and full gas central heating. Located on the lakeside caravan park in Butlins Minehead. Holiday prices include entertainment passes for up to 8 people on family breaks or 6 people for adult weekends. All the fun of Butlins for less. Fully equiped for all your self catering needs.